Alnmouth village is almost ‘picture-postcard’ perfect with its colourful cottages, at its best on a sunny day when the tide is out revealing vast expanses of golden sand. Located approximately 5 miles east of Alnwick, Alnmouth was founded in 1150 and today remains a beautiful and interesting village that is well worth exploring. There is a lovely variety of restaurants, pubs, coffee shops, boutique-style gift shops and art galleries, and a golf course for visitors to enjoy. 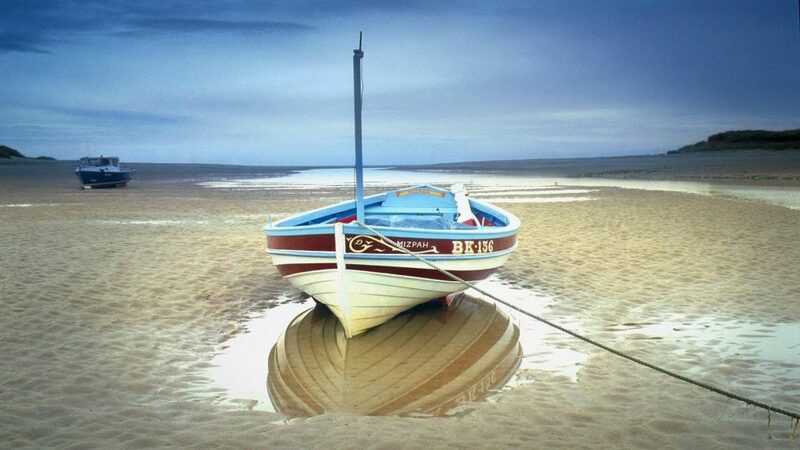 For such a quaint coastal village Alnmouth has a surprising choice of great places to dine out. Here are some suggestions, we’ve provided the telephone numbers as you’re recommended to book in advance at the restaurants as they are busy all year round. This small bustling café turns into a bustling bistro in the evening, serving fantastic home-cooked food to a high standard. It is a small and intimate restaurant with friendly staff and is great at accommodating special requirements such as vegetarians and coeliacs. Located on the Main Street and only open on Wednesday and Saturday evenings, it is highly recommended that you book well in advance. Tel: 01665 830393, or click here to visit their website. This Italian restaurant is part of the Hope and Anchor pub, located on Alnmouth high street, and has a great atmosphere. It’s open 7 days a week. They have a varied menu, a happy hour between 4-6pm which is great for taking the children out for an early dinner and an old, traditional pizza oven which is open to the restaurant for the customers to see. We would recommend booking at weekends as they get very busy as it’s popular with locals. Tel: 01665 830837, or click here for their website. With an ever-changing blackboard offering A la Carte treats such as lobster, crab, and game, you can take your own wine (£2 corkage). On a summer day the ‘Seafood Shack’ serves takeaway lobster and seafood. Usually only open weekends. Book early. Tel: 01665 830006, or click here for the website. Newly opened in Alnmouth, Hooked is a simple restaurant serving good food with a small menu. It’s conveniently located on the main street of Alnmouth. Hooked is open Wednesday to Sunday. We’d definitely recommend you book a table ahead of time to ensure your place. Tel: 01665 830335, or click here to visit their website. A really traditional pub with the best atmosphere! They have embraced the classic style and retained its original features, which adds to the cosyness of the true Northumbrian pub. They have a lovely beer garden and a restaurant too and serve a good Sunday lunch. The pub quiz is great and takes place every Tuesday. Dogs can come too! Tel: 01665 830584 or click here for their website. Newly refurbished, this traditional pub is located on the main street of Alnmouth. With the pub serving traditional ‘pub grub’, it also has an Italian restuarant called The Italia next door, and the new addition; The Crab and Lobster Bar, a fish bar serving fresh locally caught fish. The menu changes every day depending on what fish is available at the market. Its dog friendly too. Tel: 01665 830363 or click here for their website. Huge and sandy, the beach at Alnmouth is popular with walkers, families and pets. With the Aln Estuary flowing into the sea here, the ‘fresh water’ beach is often preferred by dogs walkers. There are beautiful, far reaching views of the Heritage coastline in both directions. The borough became known as Alnmouth because of its position at the mouth of the river Aln. 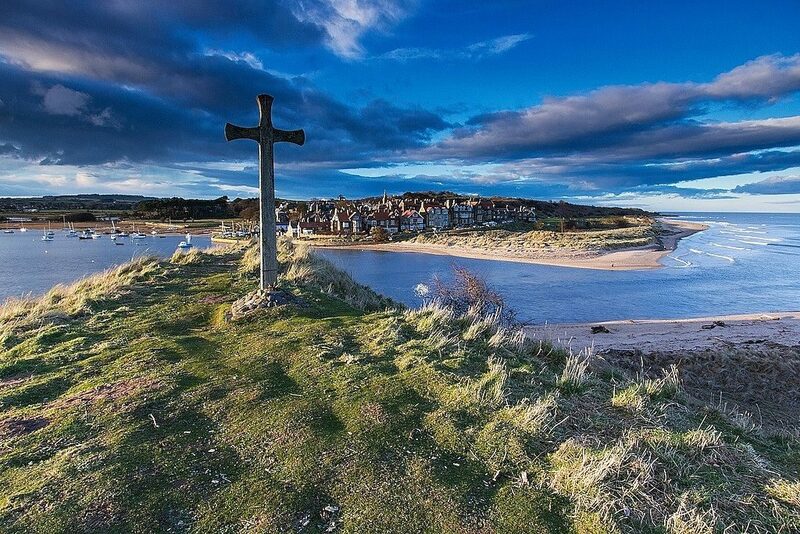 Alnmouth prospered so well that in 1207 it was granted a charter to have a port and a market. This Port then went on to become so successful that in 1316 the bailiff of Alnmouth was ordered by Royal Decree to provide vessels to Suffolk for the defence of the Kingdom. During the wars with Scotland, Alnmouth along with other settlements in Northumberland, suffered considerable damage and in 1336 was burnt down and was almost completely destroyed. In 1348 the ‘Black Death’ struck leaving Alnmouth devastated which led to more than a century of depression and ruin. By the end of the 15th century ships were once again exporting coal, wool and other produce. The late 17th and 18th centuries saw the heyday of Alnmouth’s prosperity there being at one time 16 granaries in the town. It is surprising to learn that during this period Alnmouth was exporting more corn than Newcastle. Fishing still remained a vital part of the town’s prosperity. John Wesley visited Alnmouth in 1748 and described it as ‘famous for all kinds of wickedness’. As a result of his visit a Chapel was built and still stands in Chapel lane. Besides holding services on Sundays it opened a school which was used for the children of the village until a new school was built in 1876. The great catastrophe happened on Christmas day in 1806. A great winter storm arose and the river broke through to form the channel that exists today, cutting off Church Hill from the rest of the village. During the same storm the church was blown down so that the village was left without an Anglican Church. Quite apart from the magnificant sandy beach at Alnmouth, the beautiful high level walks above the beach, offering far reaching views of the coast north and south, and the attractive estuary cutting through the beach between Alnmouth and Warkworth beach, the village itself is very interesting and quite Bohemian, with hidden nooks and crannies to discover as you wander around the network of little streets. Following the estuary all the way along either beginning or ending at the bridge, this walk is just under a mile and provides beautiful views out to the coast along the river. About 2 miles to the stone cross on top of the hill across from the estuary, a steep grassy climb up to the bronze age encampment and paths with stunning views from the historic battery. The beach can either be reached at the end of the high street, or by following a road towards the other end of the beach. You’ll be rewarded with stunning views around the whole bay. Alnmouth is 3.5 miles north of Warkworth, along the coast and there is a great cycle route from Alnmouth to Warkworth which is very popular with cyclists and walkers alike. You begin by heading up out of the village towards Warkworth, using the tarmac cycle path. You will end up near Warkworth beach, and you can then make your way to the main village. Newly re-opened, this modern and contemporary gallery features the work of local artist, Sue Fenlon, alongside the gallery owner’s work, Dale Maloney, as well as seasonal exhibitions throughout the year. Selling beautiful jewellery, cards and gifts as well as artwork, this pretty gallery also boasts a café serving fresh Illy coffee and locally baked sweet treats, perfect to enjoy outside in their pretty courtyard. Open Wednesday to Sunday. Tel: 01665 830554 or click HERE for their website. A quaint little gift shop selling local and coastal themed gifts as well as local artwork. This is a pretty little shop and worth having a browse around. Located on the main street. At the end of June each year, there is a big arts festival spread throughout the whole of Alnmouth, lasting a couple of days over the weekend. There is an arts trail you can follow which takes you in and around the village through the little streets and up narrow alleyways, to find little stalls filled with local artwork. It is a huge hit with the locals and tourists every year, and is definitely not one to be missed. Click HERE for the website. On the August bank holiday weekend each year, the village hosts a Raft Race, which gives both children and adults the opportunity to build their own raft to sail down the estuary and see who is the winner. As well as the race, there are a few other stalls and games on for children and other marquees down at the park. This is a lovely, community event which is great especially for children. On the last weekend of November each year, Alnmouth has a small evening to celebrate the turning on of the Christmas lights. Why not use this opportunity to have a meal at one of the local pubs or restaurants and have a lovely stroll around the village. Alnmouth village first makes its appearance in historical records in Saxon times when it was probably called Twyford (the place of the two fords). At that time the only land route out of Alnmouth was by a long loop round to the north. Saint Bede tells us that Saint Cuthbert was chosen to be Bishop of Lindisfarne in 684 in the presence of King Ecgfrith and Archbishop Theodore. Alnmouth is most likely to be the place described. In the 8th century, the Vikings raided the Northumbrian coast, and what could be the remains of one of their winter camps can still be seen in the Nightfold Field. In 1789 fragments of a carved stone cross were found at the foot of the Church Hill dated to the time of the Vikings. The Norman baron of Alnwick laid out the area as a new town in the early 12th century and called it Saint Waleric after the saint to whom the church was dedicated. He gave it the status of a borough, which meant that by suitable payment to a lord, a person became a burgess, with right to hold a plot of land, to build a dwelling and cultivate the plot or keep domestic animals on it. The Duke of Northumberland eventually took pity on the villagers and having bought the former granary which is now the Hindmarsh Hall, he converted it into a temporary church. At the time the Duke was having Alnwick Castle altered by an architect called Salvin and he commissioned him to take charge of the alterations to the Granary. This explains why the building that is now the village hall and which started life as a granary looks so much like a church. A new church was built in 1876. Many of the old granaries, being well constructed stone buildings, were converted into houses. The breakthrough of the river was to prove a disaster for the town. The new channel was not so deep so the old and the large sailing ships found it increasingly difficult to enter the harbour so the port was used less frequently and went into decline. Coupled with this the age of steam had arrived and the building of the east coast railway in the mid 19th century proved a much swifter and simpler method of transporting goods. In 1864 a new road was built from the station into the village over a bridge named Duchess Bridge, the Duchess of Northumberland having contributed to the cost of its erection. This dispensed with the need to travel all the way through Lesbury and Foxton to reach the village from the station. The two World wars had different effects on the village as may be seen by a study of the war memorial. All those commemorated from 1914-18 were service personnel, but of those from 1939-45 almost half were civilians. This was due to an air raid at 7.45am on Saturday 8th of November 1941. A single enemy bomber dropped a stick of bombs which effectively demolished some houses at the top of Argyle street. As we look at the quiet village today it is difficult to imagine that in the 18th and 19th century Alnmouth was a busy port, with the hurley-burly of carts and horses rattling up and down the cobbled streets. The busy quayside activity as men unloaded barrels of beer, timber, etc. and then loaded corn, pork, eggs, wool and coal back on. Traffic it seems was so congested that Alnmouth Court introduced a law that carts could not stand in the street for more than one and a half hours, the forerunner of today’s ‘yellow lines’. The old Friary is open for day visitors and residential guests too. The Friary is a welcoming place to visit or stay for time to pray, study, and relax. The Friary is open to guests through the year, apart from short closed periods, usually from Monday to Sunday (closed from Sunday lunchtime until Monday afternoon, generally after 4.00pm). Individual day visitors are able to use the communal rooms unless they are booked for a group, and the chapels and library are generally kept in silence. Individual day visitors either bring their own lunch or arrange to join the brothers and other guests for the cooked main meal at lunchtime. Day groups are asked to bring their own packed lunch, though cold drinks can be provided, as are tea, coffee and biscuits. There are occasional special events at the friary such as garden open days.